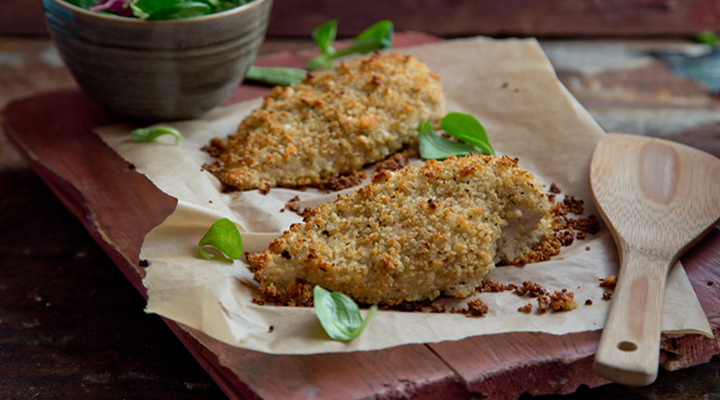 Quinoa is packed with protein and is a healthier alternative to cooking your chicken in breadcrumbs. Preheat the oven to 200oC/gas mark 6. Line a baking tray with non-stick baking paper. Half-fill the kettle and put it on to boil. Place the quinoa in a small saucepan and cover with the boiling water - you want about twice as much water as quinoa by volume. Put a lid on the saucepan and bring to the boil. When it starts boiling hard, turn the heat right down to a minimum and leave to steam. The quinoa is ready when all the water has been absorbed. Allow to cool, then fluff up with a fork. Place the beaten egg white in a bowl and lightly dust a plate with plain flour. Put the cooked quinoa, crumbled feta, crushed garlic, Italian herbs and a pinch of salt and pepper in a separate shallow bowl and mix well. Lightly dredge the chicken breasts in the flour, then dip in the egg white, shaking off any excess. Lastly, cover with the quinoa mixture, pressing it on firmly to make sure it sticks to the chicken. Place the coated chicken fillets on the lined baking tray. Cook in the oven for 20 to 25 minutes, until golden and crispy.